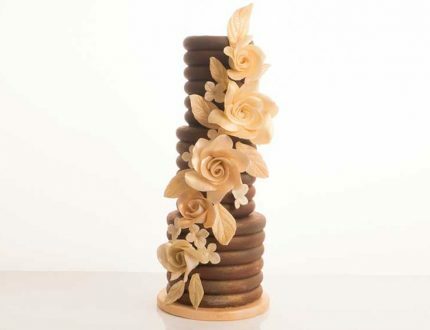 Paul starts with his three tiers all layered with a light covering of ganache. 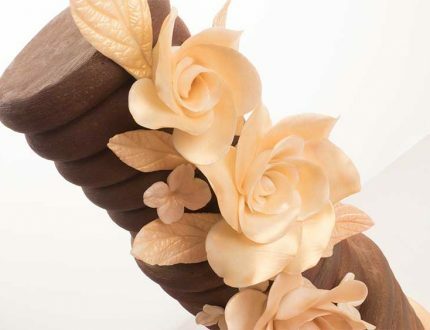 If you need help with the pre-course work please see our How to Ganache section. Paul then very thickly layers the cake in ganache before applying the comb scraper to get the desired pattern. It takes a bit of work and tinkering with, but Paul finally ends up with a neatly combed pattern. Paul’s using dummy cakes so it’s all very straightforward. 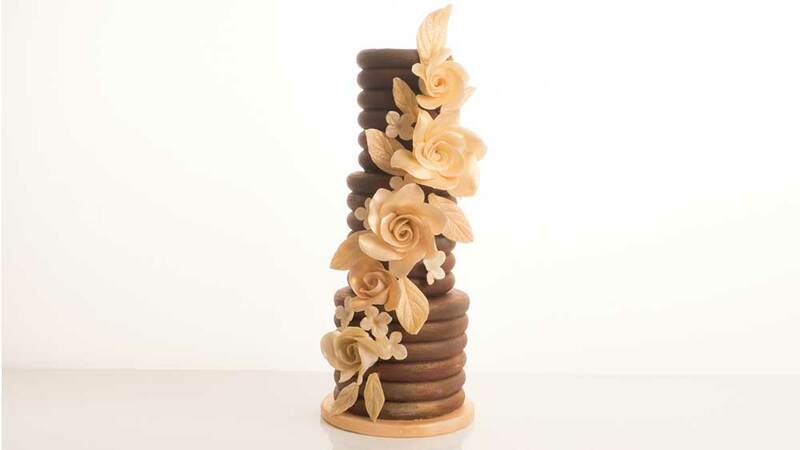 However, if you need some guidance on stacking deep cakes, please see Lesson 6 on our Double Barrelled Cake course. NOTE: If you are concerned about the stacking or delivery temperature then Paul suggests a strong central dowel to help support the tiers. In this lesson, Paul experiments with shading and colours as he seeks to achieve a deep, orangey, gold effect. With patience and adding several layers with the airbrush he achieves amazing results. Time to start creating the floral decorations. Paul creates a selection of roses, petals and fillers which he will later colour to match the cake. 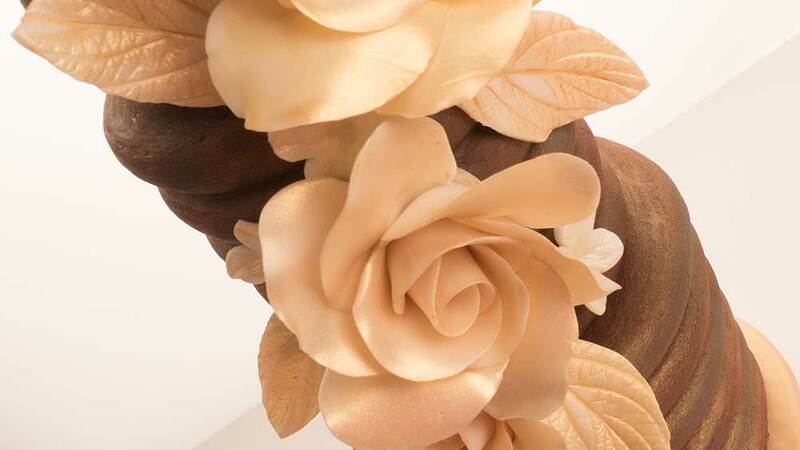 Paul experiments with adding different shades of gold to colour the leaves, roses and filler flowers. He’s very happy with the mix, but if you have a preferred shade of gold or limited by what you have available, that will work just the same. Time to get creative, but before rushing in, Paul has some great advice about laying out the design before adding to the cake. Paul adds the decorations with lots of useful hints and tips to correct anything that might go wrong. Paul shares with you some other unique ideas you could do with this cake! 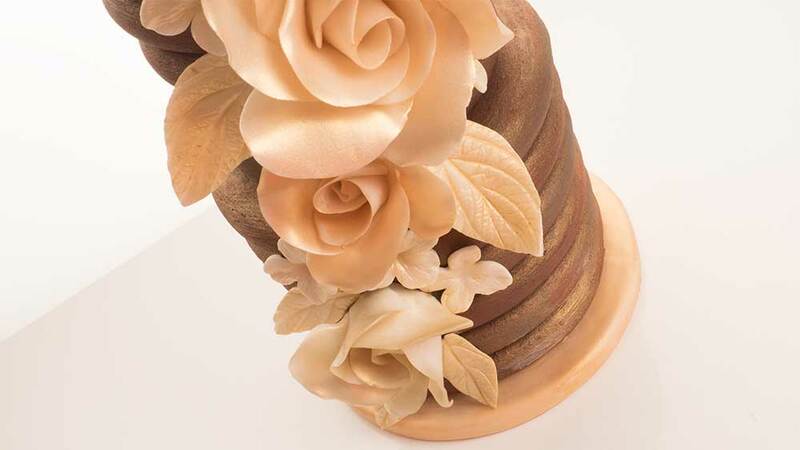 How much you would retail this cake at, including costs, overheads and much more. 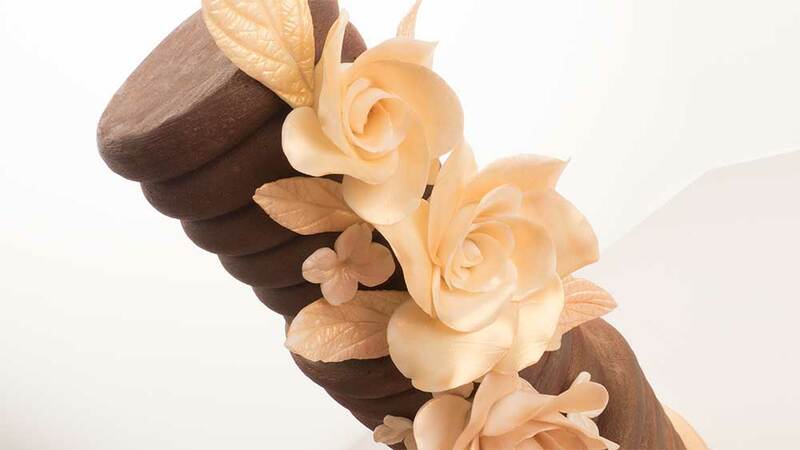 Highlights from our naked ganache wedding cake course. 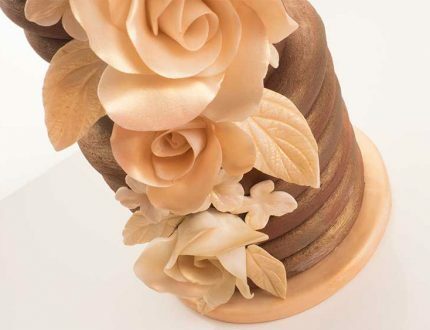 Learn how to make this naked ganached wedding cake with Paul Bradford. 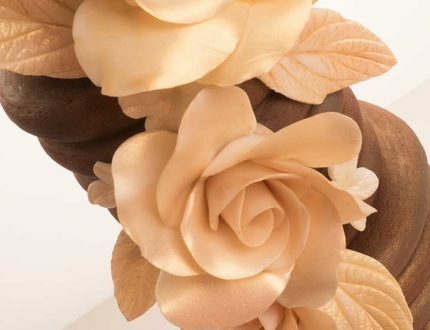 This wedding cake is perfect for any chocolate lovers tieing the knot! With a whole host of things to learn, this fun-filled cake tutorial is the perfect addition to your chocolate cake cooking collection! Don't forget to share your interpretations of this wonderful cake with Paul and the rest of the CakeFlix community on our Facebook group. View hundreds of more world-class tutorials only at www.cakeflix.com. 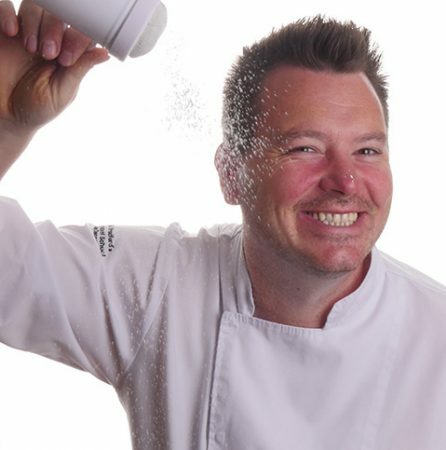 Paul Bradford´s mission is to ‘Empower people to achieve their cake decorating dreams’ by providing a range of cake decorating courses and online tutorials through their website, which currently teaches 195,000+ students.